« Ad Muncher: ad-blocking utility for Windows, now free! Found a very cool opensource automation program. 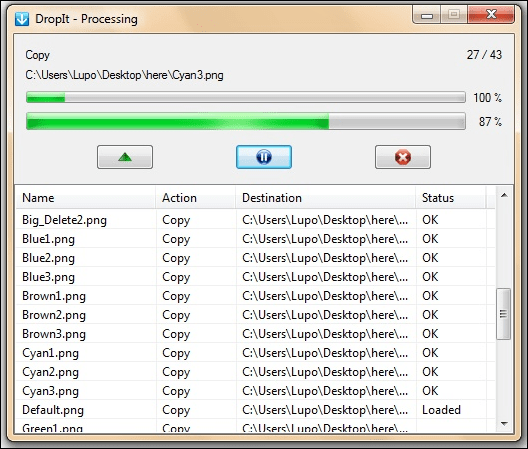 DropIt can be set up to monitor different directories on your file system. You then set up rules for different filetypes, such as moving MP3 files to a separate directory or compressing particular files into a ZIP. Then the program can automatically perform those actions periodically on files appearing in the monitored folder. This means you can just drop all your stuff into one folder and have the program automatically sort, compress, delete, move etc in the background. Also has a floating "drop icon" that you can quickly drag files to. Saves a bit of time and is completely free. x86 and x64 versions available.